Do You Know the Utilization of Your Rental Fleet? It would be a mistake to say you can only manage by looking at two numbers, however in the rental industry, the foundation of all management should be looking at time utilization and dollar utilization. By looking at these two numbers, you can quickly see how your fleet is performing. This should be done as a whole fleet, at each location, as different equipment types, as any possible division of your fleet, and all the way down to the individual pieces of equipment. 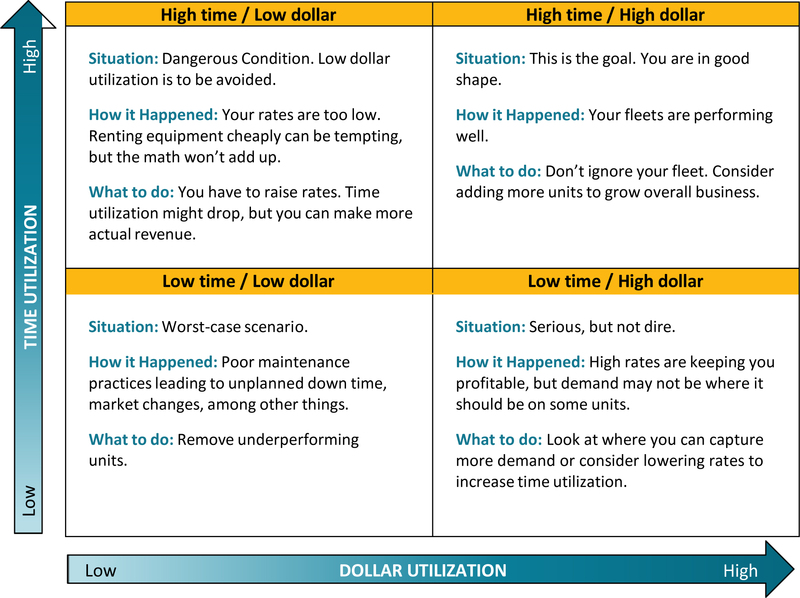 Dollar utilization is a little simpler. It is calculated by dividing annual rental revenue by original acquisition cost. The advantage to using this number is that it cannot be overly affected by outside influences. Typically, the original cost of the asset and the total revenue collected in a specific time period are easily determined. This allows very different types of equipment to be compared to each other. What should my target utilization rates be? 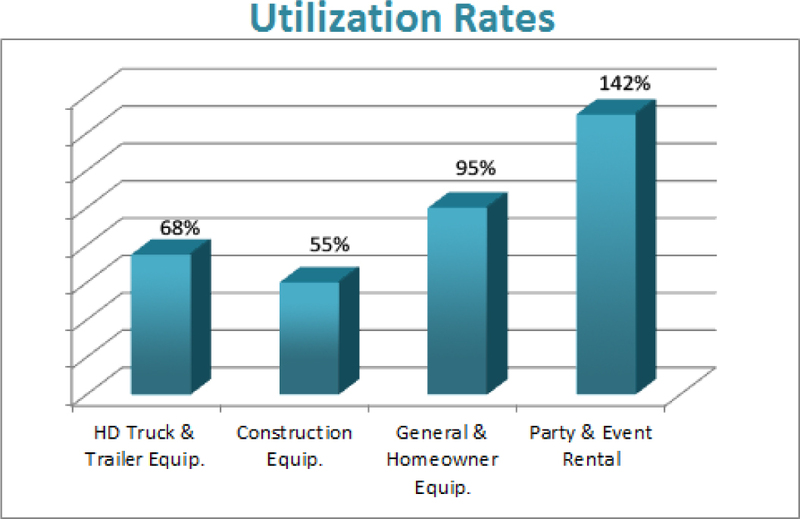 Dollar utilization rates vary depending on what type of rental industry you are in. In the graph at right, you can see just how different utilization rates can be depending in the type of business you are running. It is important to keep a closer eye on dollar utilization than time utilization. You can’t take time to the bank, so time utilization alone does not help your business much. You need to protect the dollar utilization side of the equation and only use the time utilization number to give yourself a clearer picture of what you are seeing. The grid below will give you an idea of where you stand, how you got there, and what you need to do next. To determine your unique utilization figures, use the formulas provided earlier. Once you have those, you can follow the arrows to find the box that corresponds to the situation you are facing. What we learn from looking at these two figures is that they should be looked at as a pair. If we look at just one of them, it would be easy to miss obvious trends and issues. Keep in mind that what you pay for equipment is a huge factor in the overall equation. Some typically low dollar utilization items, such as specialty heavy equipment, are very expensive. When a piece of equipment is very expensive, consider buying used, late-model equipment. Saving $30,000 on a used unit versus the cost of a new unit will dramatically improve your dollar utilization since your annual rental revenue is divided by the original acquisition cost whether you bought new or used. Karmak, Inc. is a leading provider of business management solutions for the commercial transportation industry. 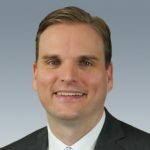 With more than 30 years of heavy-duty experience, we offer a unique approach combining innovative technology, strategic advice, and best practices. Our success programs produce measurable results by improving ROI, mitigating risks, and achieving operational excellence.